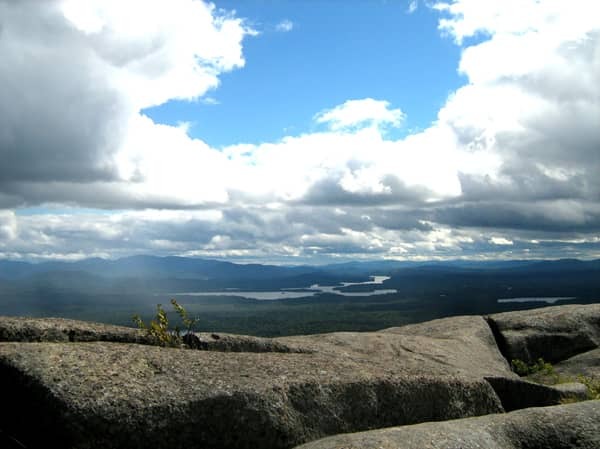 View from St. Regis Mountain Summit. Photo by Bob. 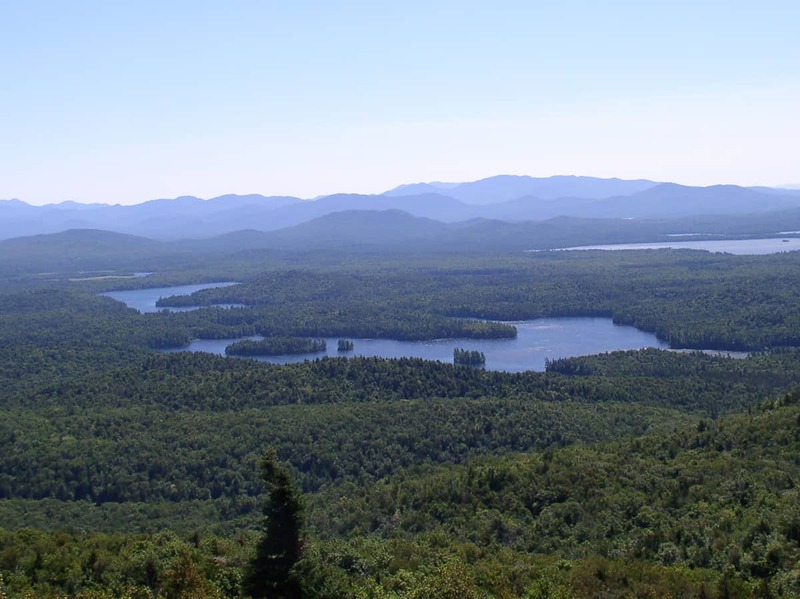 There is a great view from the top of the numerous lakes that start right at the mountain's base and extend far off into the distance. Lake Clear is right there front and center. The high peaks are visible too but they are pretty far away. 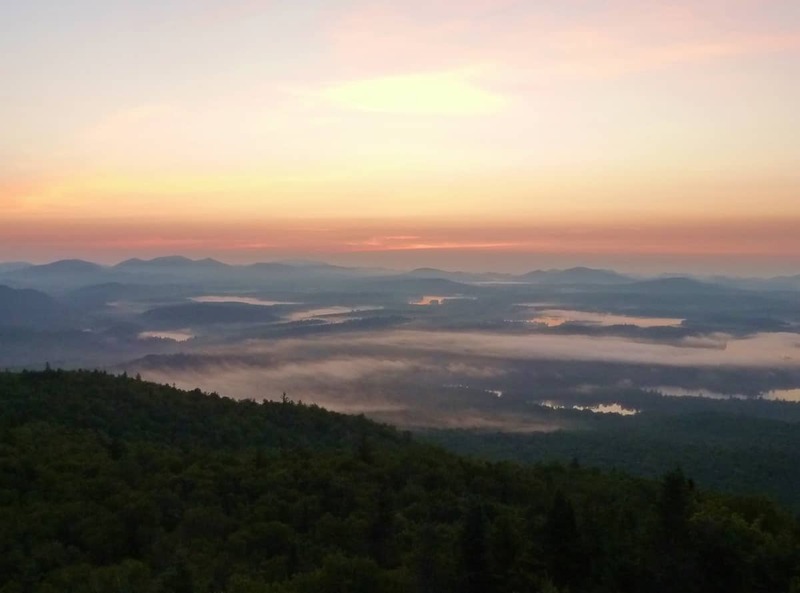 A couple of years ago, thanks to the efforts of the Friends of the St Regis Fire Tower organization, the long closed fire tower was once again open to the public. It’s an added bonus that affords a 360 degree view. One year we climbed St Regis, pitched a small tent on the one flat grassy spot, and stayed up there overnight so we could stay up late and watch the Perseid meteor shower. Then we woke up early and watched the sun rise. Pretty cool ! So far we've gotten all of the 8 grand children to the top, all but the 4 year old using their own leg power. To get to the trail head drive north on route 30 to Paul Smiths College, about 5-6 miles. You'll see the college entrance on your left. Immediately past the entrance turn left on Keese Mills Road. Go about 2.5 miles and you'll see a small parking lot on the right with a Visitor Interpretive Center (VIC) sign. About another 100 yards down the road is a large gravel parking lot on the left which is where you park. Walk down the dirt road by the parking lot about 1/10th mile to where the actual trail begins. Distance is 3.4 miles each way with a 1266 foot climb. It's certainly not easy but not too difficult a climb either. Of course all such pronouncements are highly subjective ! Have fun! No related blog posts found; this is one of a kind!